Travel to Iran with 360 and you can be a millionaire for your entire stay. Because 1 Pound Sterling is equal to 55,000 Iranian Rials, your wallet will be oozing with notes with countless zeros. That is one of the few challenges to the journey. 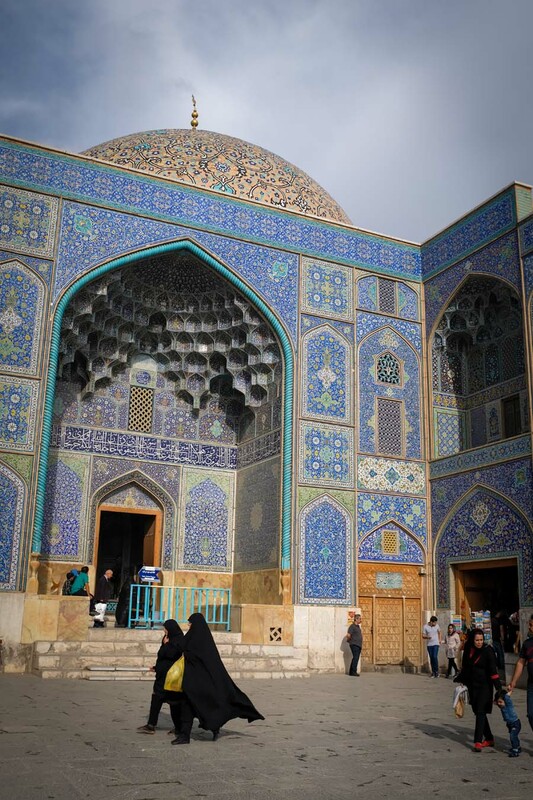 The rest of my first trip to Iran was surprisingly straightforward and easy-going. With the exception of summit day on Damavand. Mount Damavand is a striking volcano, soaring high above the neighbouring peaks with a near perfect conical form. The route to the top was tough as we were climbing early in the season and the fresh snow was deep but if mountains were easy to climb they wouldn’t be so satisfying, right? After starting with the very first light we climbed the mountain for most of the day. Whilst the route is not technically challenging the ankle-deep snow on the rocky ridgelines made it more of an adventure. Near the top, the fumes poured out of the vents and out of the gravelly surface itself. The greens and yellows were far from the monotone colours we’d be climbing earlier. 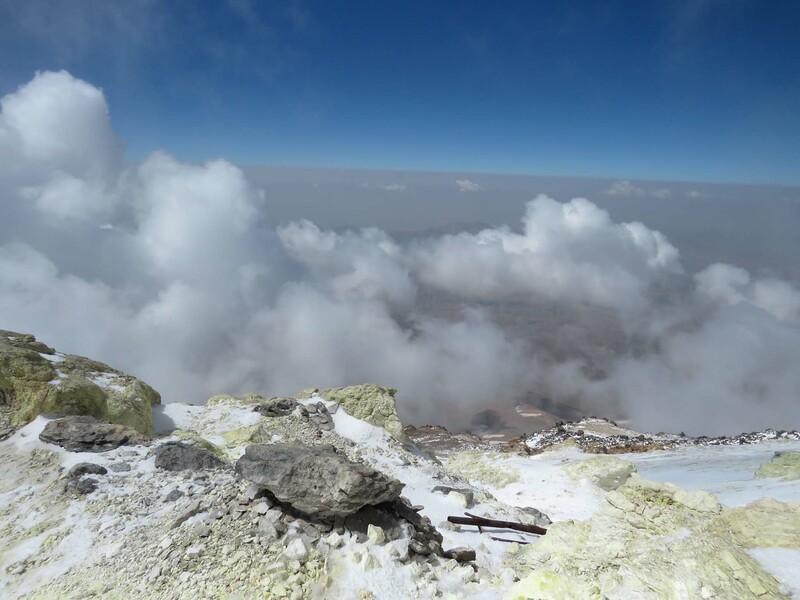 Some said that Damavand was not active but those smells seemed to indicate otherwise. Luckily this peak carries on puffing away with very little risk to life or health through volcanic activity. The summit above the vents was magnificent. Iran and the Caspian Sea stretched out as far as the eye could see, thousands of metres below me. This was one of the most satisfying peaks I have ever climbed. 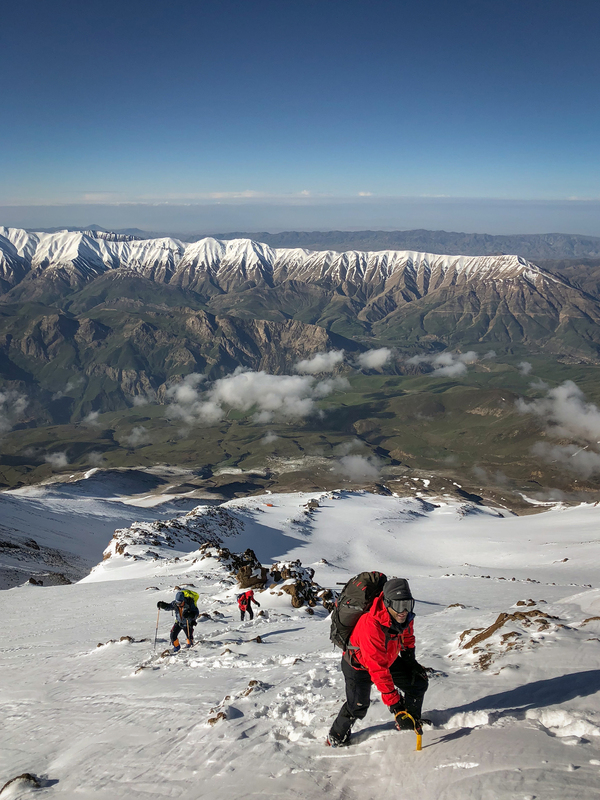 We were the only people to climb Damavand that day, possibly that week, far from the busy chaos of later in the season with hundreds of Iranians climbing the mountain daily later in the season. But this trip doesn’t just do an amazing mountain, you also get to see the real Iran. After the hot springs at the base of Damavand, we head south to see the jewels in the cultural crown of the country, from the ornate palaces, built while Victoria was Queen of England, to the vast ceremonial city dating back to 6th Century BC. We visit several cities on the week after climbing the mountain and you’ll get to wander around the beautiful gardens and explore the stunning palaces and mosques, all resplendent with beautiful tiles. The Persian history is full of colour and what we were lucky enough to see in Shiraz, Yazd, Persepolis and Esfahan represent that so well. On my flight home I was satisfied with climbing the big mountain of Damavand, but also felt I had seen more of Iran. It is one of the most beautiful countries I have ever visited, in terms of both its landscape and its historical architecture. The people were so friendly and welcoming. It is far from the Iran we see in Western media (i.e. the actions of the government) and I’m so glad I got to taste a bit of this wonderful land. I was just a little disappointed I wouldn’t be a millionaire when we returned to London!